Situated in Eastern China, roughly 100 kilometers west of Shanghai, Zhouzhuang is China’s oldest water town, dating back to 1040. Unlike many of the other water towns in the area, Zhouzhuang is still occupied by the original settlers, who were fishermen. They lived on boats, which are one of the main attractions as most tourists go for the obligatory boat ride along the narrow canals. The population is roughly 2,000 and non-residents must pay a fee to enter. 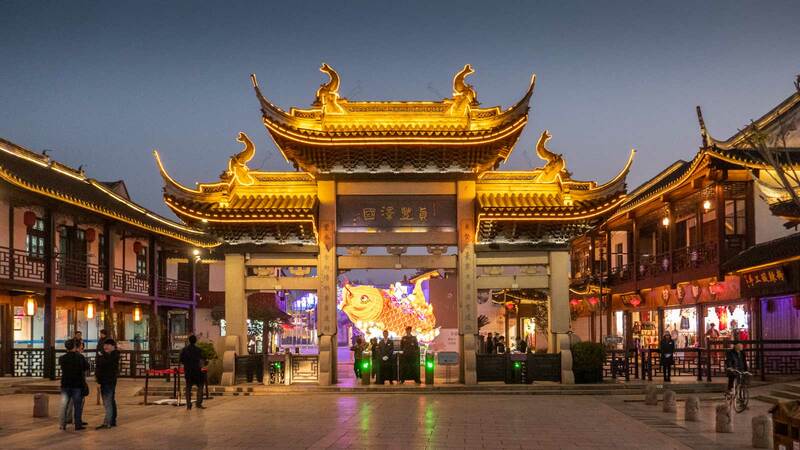 While the serene beauty of a nearly 1,000-year-old water town is reason enough to make the journey, there are other attractions in Zhouzhuang besides the canals. The Shen residence dates back to the Qing dynasty and is the largest in the village. The Zhang residence dates back to the Ming dynasty and has been restored by the local government. In addition to its 70 rooms, the property has a canal wide enough for a boat to pass through. Immortalized in Chen Yifei’s painting, “Memory of my Hometown,” the Key or Twin Bridges conjure up the ideal Zhouzhuang postcard. Perhaps the oldest attraction (besides the town itself) is Chengxu Daoist Temple, which dates back to Yuanyu period of the Song dynasty. It is still an active place of worship today. If you’re lucky enough to be in the area during the 22nd and 23rd days of the Chinese lunar calendar, you can check out a traditional celebration at the temple, replete with traditional costumes and wardrobes. As Zhouzhuang is a water town, fish is a key staple of the local diet. Bayu and bangbi are two local aquatic delicacies. If you want to eat like an emperor, try wansan, which is an eight-course meal that includes soy-stewed pork, stewed eggs, chicken, stuffing, and wheat dumpling soup. It dates back to the Yuan dynasty. Dumplings are everywhere in Eastern China, but most are stuffed with pork or a mix of shrimp and pork. In Zhouzhuang, you can try san wei yuan (sometimes referred to as tan mian jin) which come with your choice of meat (not just pork) and are flavored with shallots, ginger, and rice wine and cooked in a chicken soup. Wansan pork shank is omnipresent at stalls around the water village and distinguishable by its heavy glaze. 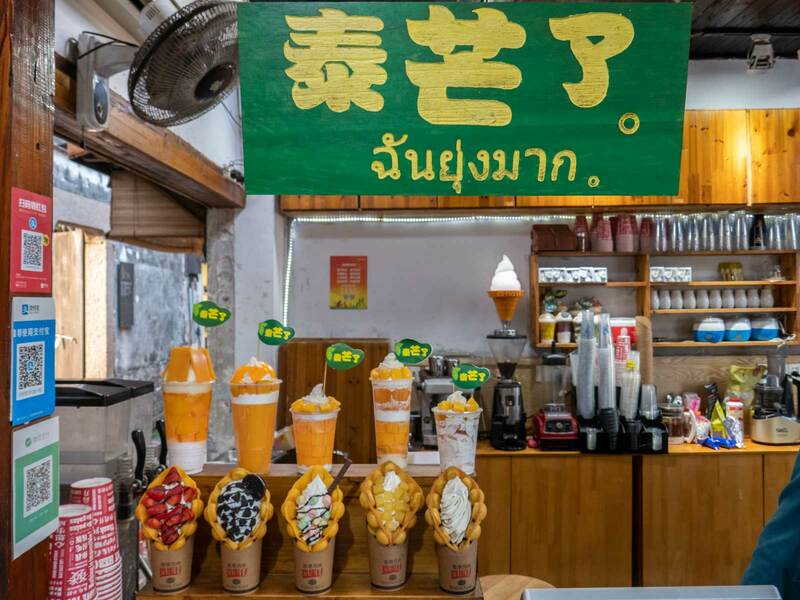 International influence can be found in some of the dessert stands, which feature ice cream and some of the Thai desserts of the moment. If you don’t speak Mandarin and want to see the main sights in an organized and efficient manner, a guided tour is the best way to go. Yes, you’ll spend more money, but you’ll also have someone to explain the food, history, and local culture. Check out Viator for options ranging from half-day tours to full-day tours of the region. The most frequent bus service is available from Suzhou, which is the nearest major city. Buses run every 30 to 40 minutes from morning to evening from Suzhou North Bus Station and Suzhou Railway Station. From Shanghai, you can take a morning or afternoon bus from the Shanghai South Long Distance Bus Station. For more frequent service, head to the long-distance general bus station. Entrance to the town will cost 100 CNY. Rowboats cost 120 CNY but can be split among passengers. This post was sponsored by Viator. Read more about the tours they offer, including the one I joined here. 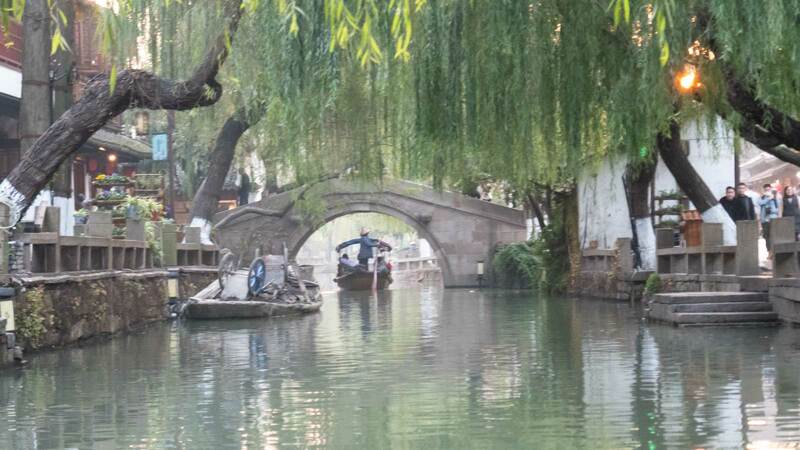 Have you been to Zhouzhuang or any of China’s other water towns? Which other ones do you recommend? Leave a comment below. This was a good post. You had so many pictures and really made your readers want to visit Zhouzhuang. What an amazing place to visit! I doubt I will ever get the opportunity, but I appreciate you sharing these pictures. It’s like going on a virtual tour! I have always dreamed of visiting China! I’ve been to Taiwan and lived there for quite a few years, which was nice because I learned to speak Mandarin. Hopefully, this year, when we are well enough to travel, we can visit Zhouzhuang. It looks like a town that has frozen in time. Really beautiful! This is the first time I heard about Zhouzhuang and I am interested on why it is called the Venice in the East. Glad there are tours available. It would be such a unique experience to visit this place. We will consider during our next China Trip. Glad there are tours available. It would be such a unique experience to visit this place. We will consider during our next China Trip. Thank you for sharing. This looks like a place that I need to visit. I would love to take my family to visit unique places like this. Zhouzhuang looks amazing! It is worth a visit for sure. A great place to make some nice shots! Love your pictures! If I ever get the chance to go to China I will go there for sure. What an amazing place to visit! I would love to go one day, thank you for sharing this wonderful destination. That’s very nice! It’s like China’s own version of Venice! I wish we had something like that here in the Philippines. This is seriously such a pretty town! All your photos look like scenes out of a movie and the 8-course wansan sounds to die for. Will definitely be adding Zhouzhuang to my bucket list!